I would like to know if there is any possibility to serve two floaters with different sizes (250×250 and 500×500) in the same zone? I think what you need is the fact that you can specify a custom size of * and * for a zone, making any ad size fit in it. If you go to a zone’s Properties page in the Revive Adserver interface, you see that can specify the size of the zone. 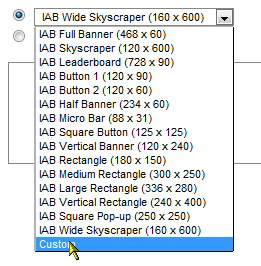 Initially, the system shows you the standard sizes as defined by the IAB, but the very last entry in the list enables you to enter a custom size by hand. Once you’ve saved the changes, you can link any size banner to this zone, they will always fit. One think to keep in mind though, is that if you use such a flexible zone in a web page, it could produce odd results. Just imagine what would happen if you attempt to display a 160×600 wide sky scraper banner in space on the page that was designed for a 728×90 leaderboard! © 2004 - 2019 Platform IQ. All Rights Reserved.